At Great Expressions we take dental health very seriously. At Great Expressions we take dental health very seriously.At Great Expressions we take dental health very seriously. Category: News & Blog | Comments Off on At Great Expressions we take dental health very seriously. A great smile can last a lifetime, and caring for your child’s teeth properly starts at birth, with a wellness visit to the dentist when the first baby tooth emerges, or by age one, whichever comes first. Not long ago there was a mistaken belief that baby teeth didn’t matter because they eventually fall out. That belief was tragically wrong. Fortunately, we now know better, and taking the right steps, well before your baby takes his or hers, can help put them on a path to a healthy mouth and smile for the rest of their life. Based on 40 years of helping our patients achieve the dental health and smile they deserve, we’ve found there are proven steps to taking excellent care of your child’s mouth, and they start with an understanding of baby teeth. 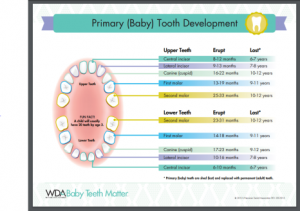 Your baby has 20 teeth in their jaw when they’re born, referred to as primary teeth, and they first begin to emerge when your baby is between six months and one year old. The first primary teeth may begin to fall out around age six, but a final few may remain until age 12, and sometimes even beyond. In fact, some children will need to have remaining baby teeth removed in order to maintain good dental health, and prepare for orthodontic treatment. – Enabling adequate chewing, leading to better nutrition. – Helping in proper speech development. Your child’s tongue, lips, and cheeks depend on their teeth to properly form sounds and speak. – Holding space intact for adult teeth and guiding a pathway for them as they emerge. Premature loss of baby teeth can affect the alignment of adult teeth. In this way, primary teeth can act as nature’s braces. – Helping with facial development by supporting facial shape and muscle development. – Directly affecting the health permanent teeth. Permanent teeth develop close to the root of baby teeth, so caries from baby teeth can affect permanent teeth, causing life-long damage. – Teaching kids to care properly for their teeth gets them started on the healthy habit of good dental hygiene that they can carry into adulthood. When should you take your baby to the dentist for the first time? Your pediatrician can help you decide the right timing but, under typical circumstances, the first visit to your dentist should take place either when the first tooth emerges, or by age one, whichever occurs first. This visit is important because your dentist can evaluate the health of your child’s mouth, provide tips for home care, and discuss any detrimental behaviors like thumb-sucking or overextended pacifier use. Taking good care of your baby’s dental health starts just after birth, when you may begin wiping their gums with a clean, moist washcloth or gauze pad. Once your baby’s first tooth emerges, it’s time to start routine brushing. For kids under age three, use an age-appropriate soft toothbrush, with fluoride toothpaste in an amount the size of a grain of rice. Most dentists recommend you brush in the morning and evening, but your dentist will provide tips on the right approach for your child. Often by age three kids are ready to get involved in the brushing process, but it’s important that you feel they are ready to participate. It’s not uncommon for kids to require some level of assistance until around age seven. There are many ways to make it fun, including giving them a toothbrush with their favorite characters, and using a toothpaste flavor they like. You can further motivate them by making brushing like a game, and there are many smartphone apps as well as offline and online books that can help. Using fluoride toothpaste in the amount about the size of a pea, you should ensure they brush twice a day. Once they have teeth that are touching, it’s time to start cleaning between their teeth with dental floss. The other factor in taking good care of your child’s teeth is a healthy diet. Foods that are sugary, starchy, or sticky stay in the mouth longer, and therefore are more likely to cause caries. What are the risks that affect baby teeth? The most common risk factor is decay, as studies have shown one in four children have cavities by age five. The first sign of a potential cavity is often discoloration of the tooth and/or minor pitting. If you notice these signs, or see a cavity, you should immediately have your child evaluated by a dentist who will determine if further treatment is required. Ideally, baby teeth should remain until the respective permanent tooth emerges. If space is left open too long, the remaining teeth can shift, affecting the amount of space the permanent tooth will have when it erupts. This can result in overcrowded or misaligned permanent teeth. If a baby tooth falls out prematurely you’ll want to consult with your child’s dentist, who can determine if the use of a spacer could benefit your child’s future dental health and appearance. 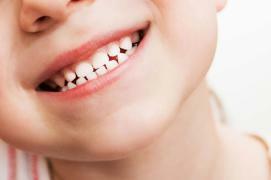 While other teeth may be affected, early childhood caries usually affects the upper front teeth. As we already shared, decay can cause many problems that could immediately affect your child’s dental health, with the possibility of significant long-term consequences, so prevention is important. Simply avoiding the above causes can help prevent baby bottle tooth decay. Good hygiene is also important, including cleaning your baby’s gums with a moistened wash cloth or gauze pad after feeding. Additionally, you’ll want to avoid placing drinks that contain sugar, like juice or soft drinks, in your baby’s bottle, and keep bottles and pacifiers clean at all times. Finally, getting your child to safely transition to drinking from a cup will help reduce the risks of bottle feeding. Baby teeth matter a whole lot and we can help! Taking care of your baby’s teeth is an essential part of maintaining their overall good health. When your child is ready for their first visit, our doctors and practice teams are ready to help. Click here to find a convenient location to schedule your baby’s first appointment, and we look forward to helping make your child’s smile be all it can be for a lifetime!